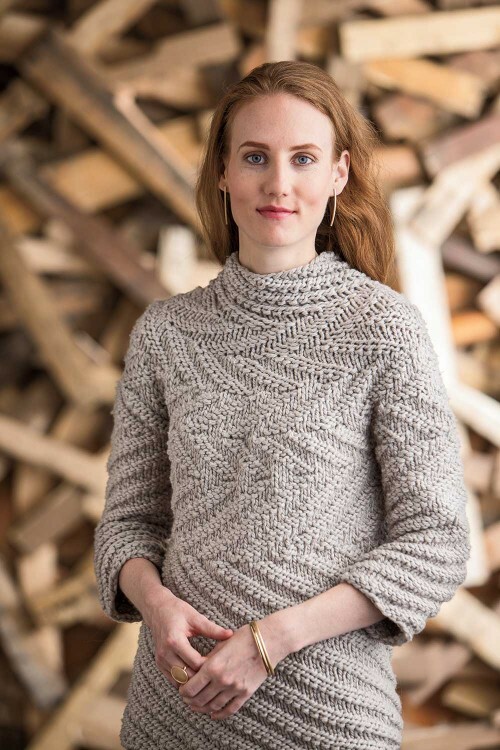 The Arrow Yoke Cardigan is knit with Sweater yarn to create a striking cold-weather layering piece using the brioche stitch, a unique technique which is the focus of Mercedes Tarasovich-Clark’s new book, Brioche Chic. It is knit from both the top down and the yoke up: the dual wide bands of brioche arrow patterning are knit flat and then joined at the ends, forming the base for this cardigan. The body and sleeves are picked up along one side of this brioche band and knit in simple stockinette stitch. The yoke is then picked up on the opposite side and knit in a decreasing rib pattern. This clever cardi is sure to be a show-stopping addition to your fall and winter wardrobe this season! Knit with our super bulky weight yarn Outer, the Spiral Pullover by Cathy Carron is a wonderfully warm sweater that’s easy-care, too! It’s worked from the top down with a seamless yoke; the continuous spiral stitch pattern knit in a chunky gauge gives this design graphic impact. Pattern appears in the Fall/Winter 2014 issue of knit.purl magazine, as well as on the cover! We look forward to seeing your projects knit with Spud & Chloë yarns this fall; be sure to share your project photos with us here in the Friends of Spud & Chloë Ravelry Group!